The Wellspring pool from Thursday Pools is a large freeform shaped pool that is available in lengths of 40′ or 36′. Along with the beautiful lagoon style shape of the pool are many great features. 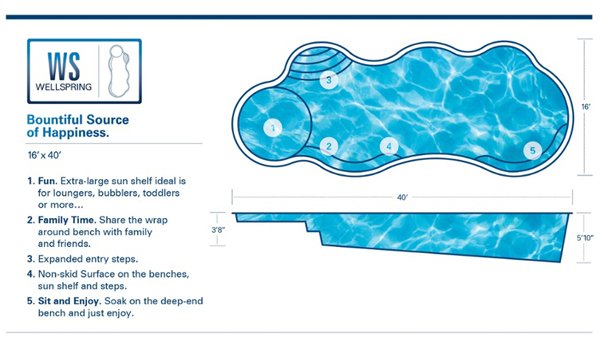 This pool has a built in sun shelf/tanning ledge area that can be equipped with bubbler water features. This area is a great place for adults to sit back and relax as well as a safe place for small children to safely play in the water (with adult supervision of course). Two benches come standard in this pool giving plenty of seating options in both the shallow end and the deeper end of the pool. The entry steps and benches are designed in such a way to still maximize the main swimming area of the pool. If you love the natural freeform shape of the Wellspring, but are looking for a smaller tanning ledge/sun shelf area we’d recommend taking a look at the Sun Down pool. The Wellspring pool is installed in Illinois by Signature Pools. The short video below is of a Wellspring 40 pool we built in North Aurora, IL. The second video is a 360° video of the Wellspring pool we designed and built in North Aurora, IL. Simply press play and then you can drag your mouse on the video screen to see the pool from a different angle.